Thanks to a head’s up from Tim Carstens last Sunday morning (1/15) I saw a drake northern pintail, Anas acuta, at Lake Junaluska. This “nomad of the sky” is cosmopolitan in distribution, breeding in northern Europe, Asia and North America. Its range has been estimated at more than 11 million square miles and it is known to overwinter as far south as Panama, sub-Saharan Africa and South Asia. Some even make it to Hawaii and other Pacific Islands for their winter break. Not even oceans can deter this sleek strong flyer. One pintail tagged in Labrador, Canada was found nine days later in England and several pintails tagged in Japan have been recovered from the U.S., as far east as Mississippi. The northern pintail, in North America, breeds from the prairie pothole region of the Upper Midwest, across Canada and Alaska. Nearly half of this population migrates through California. Many overwinter in California’s Central Valley but others continue south to the west coast of Mexico. Northern pintails in the Central Flyway overwinter from the Texas Panhandle down to the Gulf coast of Texas and Louisiana, most of those in the Mississippi Flyway spend their winter in Louisiana with smaller numbers spread throughout Alabama, Arkansas, Mississippi and Tennessee. The primary wintering range for northern pintails in the Atlantic Flyway is along the Atlantic coast of New Jersey, Virginia, Maryland, North Carolina, South Carolina and Florida. North Carolina generally accounts for 50 percent or more of this population. The drake northern pintail is one handsome dude. The head is chocolate brown with a clean white stripe that snakes up from the white breast and neck. The back and sides are slate-gray with black highlights and it has a bright white rump patch. The “pin” tail is long. It can account for a quarter of the total length of an adult mail in breeding plumage. The middle two tail feathers are black and the outside ones are gray with white margins. An iridescent green speculum is displayed in flight and the bill is blue with a black stripe in the center and black margins. The female is more muted with a tawny head and a mottled brown and white body. Her bill is dark blue-gray, usually with darker blotches. The female has a rather long pointed tail as duck tails go, but nothing comparable to the male’s pin. The drake’s tail accounts for most of the colloquial names – like spiketail, sprigtail, sprig, etc. but I knew them in Louisiana as snakeheads. I’m not sure of the origin of this name – I’ve heard two accounts. One is the white stripe that “snakes” up the drake’s head and the other is in reference to the bird’s habits. Pintails are a skittish lot and when they’re on the water and they become alarmed they raise their heads up on their long snake-like necks to get a better look around. Because of the pintail’s immense range and global population it is listed as a species of least concern. However, the northern pintail’s North American population has been in a tailspin since the late 1950s. Numbers have dropped from an estimated 10 million in 1957 to around 3 million today. Disease has played a part in the loss of North American pintails, both in the past and more recently. 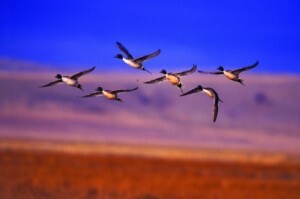 Two outbreaks of avian botulism in Canada and Utah in 1997 claimed close to a million pintails. But loss of habitat and changes in agriculture appear to be the most serious threats to North American pintails. Numbers from the Atlantic Flyway mirror this dramatic decline. The Atlantic Flyway Midwinter Survey recorded an average of about 250,000 birds in the late 1950s. Today’s survey records about 50,000 pintails. North Carolina joined South Carolina, Virginia, Maryland, New Jersey and Florida in 2004 to create a multiagency project committed to finding ways to reverse this population decline.